GAMERA: SUPER MONSTER is the final in the “Showa” series, which includes all the badly-acted, badly-produced GAMERA films since his inception in 1965. In a long line of worst films, Daiei Studios saved the absolute worst for last, aiming SUPER MONSTER unabashedly at children, hubristically not bothering to imbue it with one lick of quality. SUPER MONSTER was churned out as a venal cash grab, and it effectively killed the Gamera property. (There would not be another Gamera film for 15 years – until the spectacular GAMERA: GUARDIAN OF THE UNIVERSE (1995) would magnificently resurrect the giant Chelonian.) It is exhausting trying to tease out anything of value in this disjointed, unprofessional, uninteresting, unthinking piece of turtle turd. Nothing can be said about SUPER MONSTER, because it is not a movie. It was made with the snidest intentions, without any nod toward propriety or ethics. Veteran Gamera director Noriaki Yuasa, and veteran Gamera writer Nisan Takahashi are only credited because they were responsible for the stock footage that is used so blatantly and ignominiously. There is new footage that attempts to cohere the stock footage (of three superhero babes with disco moves and red capes who interact with some Japanese boys in painfully tight shorts, and stand up to disembodied alien voiceovers threatening to take over the Earth), but this footage barely makes sense – scratch that! – this footage makes no sense whatsoever. 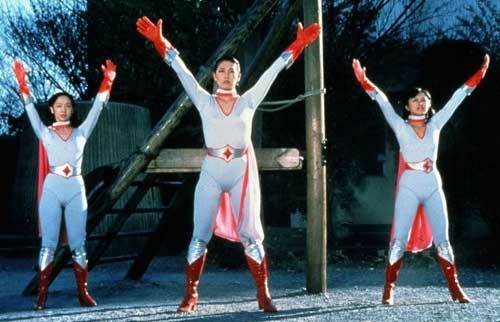 One of the – ahem – “spacewomen” touches a Casio keyboard on her car dashboard and the car turns into a ball of orange light that the other two gals leap into, in their silvery jumpsuits with the totally Visible Pantyline (aka Risible Pantyline – those corsets are square in more ways than one!). Keeping to the keyboard theme, the Annoying Kid starts tootling around on his double-manual organ, playing and singing a tune that should warrant him getting slapped really hard. Somehow he remains unslapped every time he sees fit to destroy our ear canals with that pollution. Pet turtles try to remind us this is a Gamera movie because Gamera doesn’t appear until 30 minutes in. Unrelated to the story, unrelated to the filmstock, unrelated to anything – Gaos attacks. He’s attacking somewhere we’ve never seen before for a reason we’ll never discern. Doesn’t matter, ’cause Gamera kills him. Spacewoman ad-libs something about Gaos while looking Over There, and we’ve connected the two disconnected pieces of film. Little boy plays organ and sings like a mad fruit. Next, Gamera battles an uncharacteristically silent Zigra, the fish-alien. (If you remember, this aquatic conqueror couldn’t shutup about how badass he was – here, relegated to quickly defeated hench-monster.) Spacewomen look Over There as if seeing Zigra defeated. We have connectivity. Little boy plays organ and sings like a mad fruit. Then Viras, the octopusoid. Spacewomen Look. Connectivity. Then Jiger the triceratopsian. Then Guiron the blade-head. Followed by Barugon, oh rainbow-flavored Barugon. Spacewomen Look. Boy Plays. All Connected. Who cares? A sigh of relief as the film comes to a close with spacewomen exhausted from Looking Over There, Annoying Kid exhausted from wearing tiny trousers, and flying turtle exhausted from jumping the shark. Starring: Mach Fumiake, Yaeko Kojima, Yoko Komatsu, Keiko Kudo, Koichi Maeda, Toshie Takada.